1. The headset does not compatible with PS4, XBox360 etc, only for PC computer. 2. The package contains a driver, and you can install the driver if you want the 7.1 sound. But the driver cannot support Win10. Sades website has the driver for Win10. 3. It is not obvious vibration when you listening to the light music. 4. The Driver cannot work for MAC. Equipped With High Performance 7.1 Audio Decoding Chip, 7.1 Virtual Speaker Terminal Technology, Abundant 7.1Channel,High Quality 40 mm drivers with neodymium magnets, Which Can Ensure A More Stable And More Clear Audio Output, Perfect Bass And Treble For Gaming, Experience Real Games. Fashion Design With Suspension metal headband, Unique Padded Flexible Stretchable Headband. Equipped With Protein Ear cup, Comfortable Ear Cushions Ensure Extend Period Wearing, Ergonomic Design, Soft To Touch And Good Breathability. Perfect Noise Isolation. Over-ear Soft Ear Cup Design, Cuts Out External Sound Effectively. Build A Virtual Surround Sound Effect, Acoustic Positioning Precision, Plug And Play. Easy Adjustable Mic for exact positioning, Separate Volume Control, Convenient For Games Control. Build Quality Mic, Enable To Make You Sound Fine During Your Games. Separately Remote Control for sound and Mic. 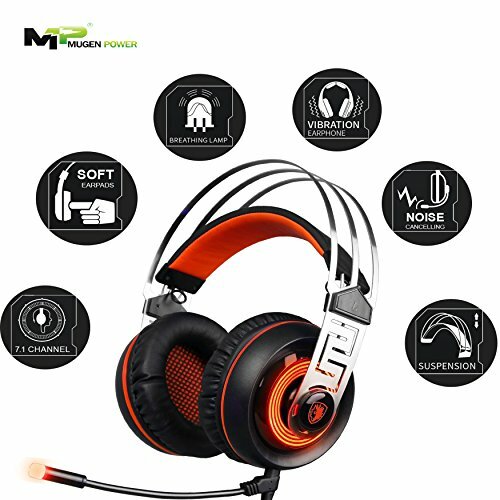 Compatible with PC Windows XP,Win10, Win7, Win8,etc.With an internal audio volume control for quick and convenient adjustment, Pro USB gaming headset is for PC but not support XBOX, PS3/PS4.